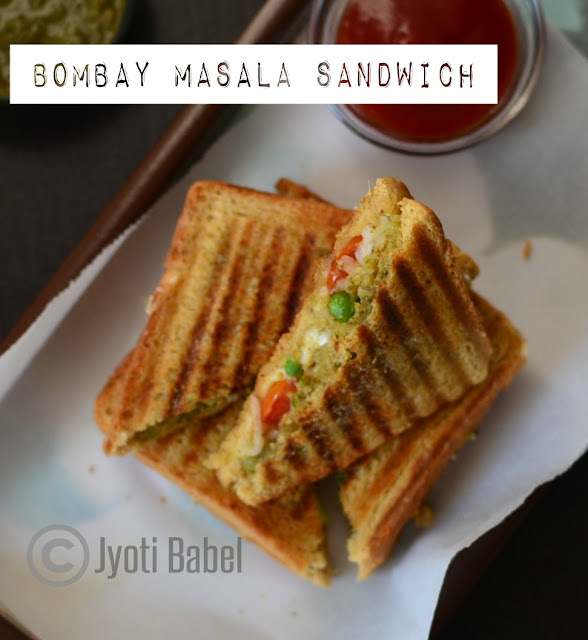 Bombay Masala Sandwich is a very popular roadside snack from the city of Mumbai. Between two grilled bread slices smeared with a generous amount of green chutney and butter is a spicy potato mixture topped with onion and tomato slices and grated cheese. The roadside vendors are very generous when it comes to filling it and topping it with cheese. I, however, exercise caution when I make it at home. However, if you like it cheesy you can be as generous as you like! 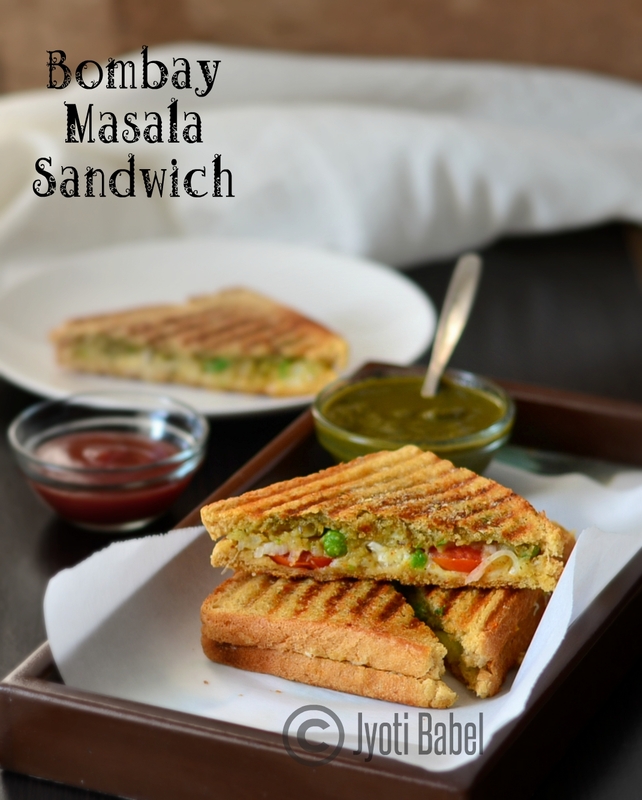 It is best to have this sandwich when it is freshly made - crisp and hot, along with a cup of masala chai. Here in Pune, I have been to a very popular roadside joint somewhere in F.C.Road which sells a variety of sandwiches - the most popular among them being Bombay Masala Sandwich and Chocolate Sandwich. Every evening and especially on weekends one can see a huge crowd queueing up there to get a sandwich to munch on. Well, these days I can't imagine going there tagging Baby M with me. So, I end up making it at home. 2. Add the mashed potato, peas, salt and red chilli powder and mix well. Cover and let it cook for 2-3 minutes. 3. Add garam masala and the chopped coriander leaves and mix again. Take it off heat and let it cool a bit. 4. On one side of each bread slice smear the green chutney. On half of the slices spread the prepared potato mixture in a thin layer. Spread a layer of tomato slices and onion slices. Sprinkle some chaat masala and spread a layer of grated cheese. 5. Cover it with another bread slice with the green chutney side down. Repeat the same with the rest of the slices. 6. On the outer sides of the prepared sandwich, apply butter generously and grill them in a preheated sandwich maker till they are crisp and golden lines form on the outer side. 7. Serve hot with green chutney and tomato ketchup. Enjoy with a cup of masala chai or coffee. Note: You can also add thin slices of capsicum along with tomato and onion slices. That looks so yummy Jyothi. What's not to like about bread, spicy potato and cheese. I love this sandwich and can have it for any meal!.your pictures have surely turned out so good! I think that Mumbai roadside sandwiches are absolutely the best. Utterly delicious. Am ready to die for this sandwich and your pictures are real torture yaar. Perfect grill marks and love it. Awesome I love this Mumbai street food , perfectly made I am drooling over the pics . I love this famous masala sandwich and can have it anytime.